The Ratcliffe Spitfire is a unique project; a full-scale replica Spitfire built by school children. It aims to honour the tens of thousands of flights taken from Ratcliffe Aerodrome during WWII by the Air Transport Auxiliary (ATA) when the airfield was designated as No.6 Ferry Pool, but also as a mark of respect to Old Ratcliffian Paul Baillon who was killed flying a Spitfire during the Battle of Britain. The actual Spitfire we are building is Mk1a P9503 as flown by Old Ratcliffian Paul Baillon in October 1940. 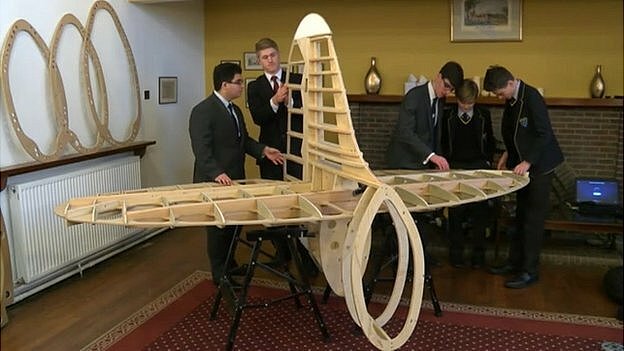 There are many replica Spitfires in the world, but none made by school children, and especially to this degree of authenticity. Not only are the students working to exacting accuracy, but they also have available to them all the known remains of the original aircraft which they are replicating; P9503. Working from over 3,000 Supermarine blueprints as well as books on the subject, the majority of the work is being carried out in wood. However, don’t let that fool you into thinking that this is not going to look or feel real; one of the primary aims of the project is to be as authentic as possible, so that when somebody climbs onto the port wing, slides back the canopy, opens the small access door, and drops into the seat, they will feel as though they are sitting in the real thing. Once the Spitfire build is complete in 2018, we want to use the building as an Educational Centre which will showcase our full size replica Mk1 Spitfire and which will be similar to a great number of Spitfires which were housed at Ratcliffe Aerodrome during WWII. Support Us – we need to raise money in order to enable the Ratcliffe Spitfire Project to continue the fuselage build stage and we need to construct a large suitable, water-tight and secure building in which to house the entire plane during the next phases of its build. To achieve that we need to raise money from individuals and organisations interested in supporting this type of important, historical work for students. Please support us by clicking the DONATE button below.